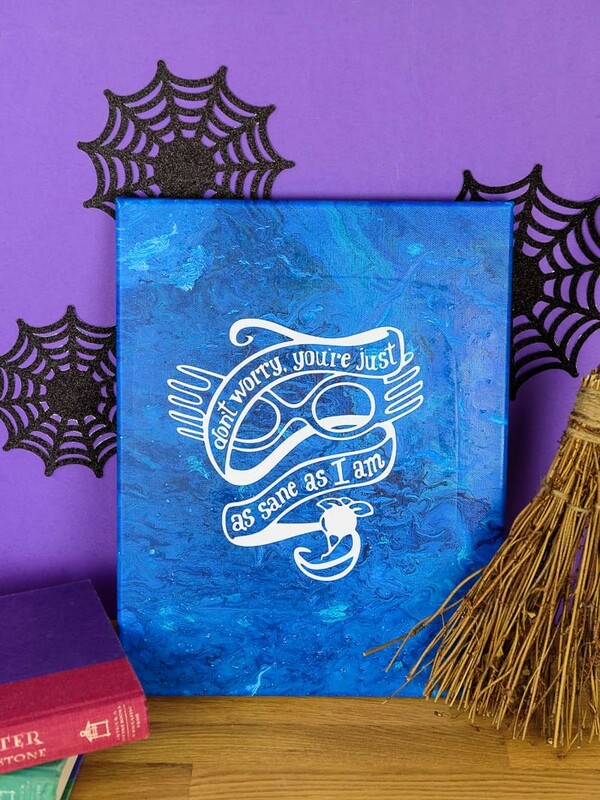 Celebrate everyone’s favorite eccentric character with this Harry Potter Acrylic Paint Poured Canvas! Have you ever been a little terrified to finish a craft project? Like, you just have one step left but this one step could mess up the entire project if it goes wrong. That’s how I felt about this Harry Potter acrylic paint poured canvas. I wasn’t sure if putting the decal on the acrylic pour canvas was the right thing to do. Because if the heat or the transfer paper ruined the paint on my canvas, I’d cry. Big, ugly, crocodile tears. Kim Kardashian ugly cry you guys. It would be bad. And I might’ve had a few. Because the beautiful blue canvas I had originally made got dropped and paint smeared/came off and I couldn’t use it anymore. But you know what? I made a new one and it came out so great and it was perfect for my Harry Potter decal! So in the end I was happy. Every year when September 1st rolls around I get a bit nostalgic. I miss diving headfirst into the newest Harry Potter book for the first time and finding out what my favorite characters had been up to. I miss all the guessing and theories that were swirling around about Harry defeating the horcruxes and who would survive the final battle. But even though the final three books completely wreck me I keep going back. I can’t imagine a life without my complete hatred for Umbridge (rivaled only by Voldemort), my loyalty to Dumbledore, my love for the Order and the quirkiness of Looney Luna Lovegood. This year I’m celebrating my love of Harry Potter with Marissa over at Rae Gun Ramblings for her Happy Harry Potter series! I try to join in every year because I love having a reason to celebrate the famous boy wizard and his friends with other bloggers who are just as obsessed as I am. So if you’re looking for other Harry Potter goodies, go check out the series this year! 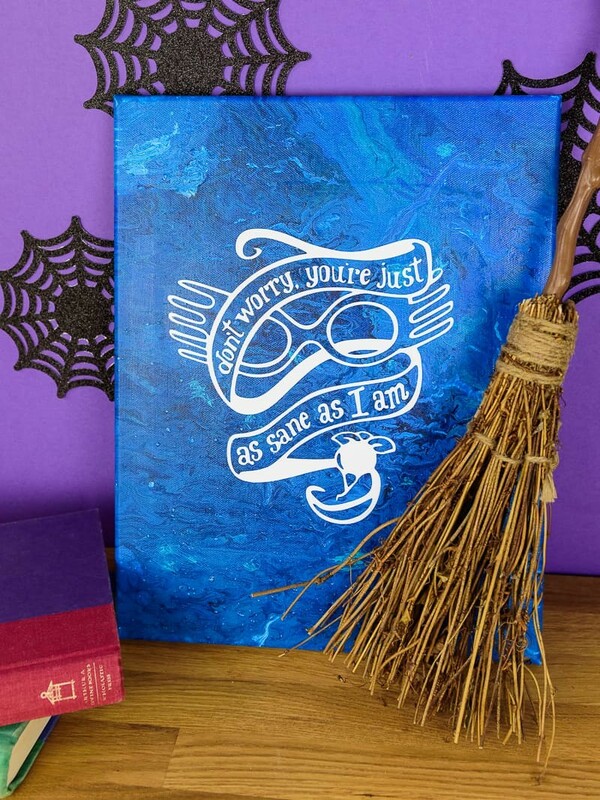 Make your own Harry Potter acrylic paint poured canvas! I just want to put a disclaimer out here right now….I was scared out of my mind to put vinyl on this! I didn’t want to mess up the design so I had to psych myself up to do it. It took a few days. Okay…now on to the tutorial! You can do this one of two ways: with heat transfer vinyl OR permanent (651) vinyl. I chose HTV. + Cut your vinyl with your Silhouette or Cricut Machine and weed the design. + Heat your Cricut Easy Press to 330 degrees (timer should be on 15 seconds). +Lay your vinyl on the canvas, place a teflon sheet on top, and press with your EasyPress. I know this project isn’t the norm for what I do around here. Usually I’m all about quick and easy projects and, unfortunately, this Harry Potter acrylic paint poured canvas takes a few days. But you guys, it’s so worth it! I just love how it turned out and how unique this is. 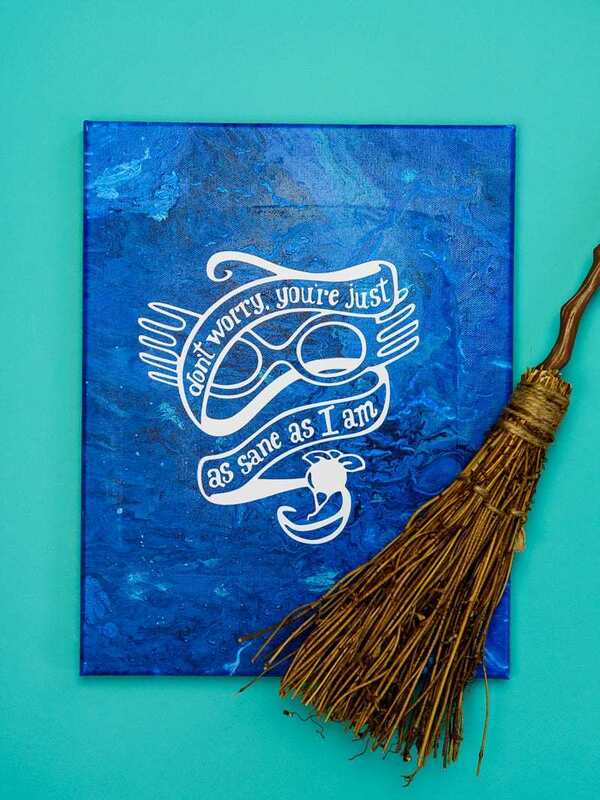 I think all Harry Potter fans need these crafts in their lives! ALSO! I joined in the Harry Potter Series over at Rae Gun Ramblings again this year and she has an awesome giveaway going on over on her blog the whole month of September! If you love all things Harry Potter, you should check out all the goodies other bloggers are making!